It’s a very rough estimate, but I’m crediting 5.6 jokes per minute to this crackerjack American comedy – the punchlines jostle one another, not with one-upmanship, but a desire to turn around your pleasure or double down on a delirious riff. It’s no surprise that the team of Tina Fey and Robert Carlock helped usher this series to air, as it bears trace elements – including the rat-a-tat humour – of their hits 30 Rock and Unbreakable Kimmy Schmidt. Creator Tracy Wigfield, who does double duty here as an apocalyptically angry weather presenter, worked on 30 Rock, and she’s produced a gentler take on the madcap workplace comedy. Katie is stuck on lightweight assignments, such as “Halloween costumes for obese pets”, and the show makes clear that it’s not a simple matter of Carol holding her back with feckless fears, but that sometimes Katie relies on her mother to boost her up and that she lacks adult fortitude. It could be a saccharine relationship, or a scalding one, but the grace note of maternal love is just strong enough to offset the more prominent gags, which are strung together across 22 minute episodes that can be watched in easy, joyous batches. Being in news rather than entertainment allows for distinct digs, and there’s a succession of spot-on story suggestions from Nicole Richie’s Portia Scott-Griffith, Chuck’s younger co-anchor. “Is there a silent killer hiding in your family’s handguns?” she asks with autocue authenticity, and the workplace elements are silly but successful, whether it’s the feuding hosts or the glib English executive producer, Greg Walsh (Adam Campbell), who doubts Katie but values Carol because she can wrangle Chuck. The first season is available, with a second to come, and you’ll catch on to the optimism that helps distinguish Great News from its obvious predecessors. There’s more to this show than the headlines. In Brief: Ozark S2 (Netflix): I recommended the first season of this crime thriller back in BINGE-R #64 [full review here], with praise for its culture clashes and cold to the touch visual tones, but it’s never become a headline Netflix title. With the second season out today, which picks up hard on the heels of the first, it might be time to reconsider. 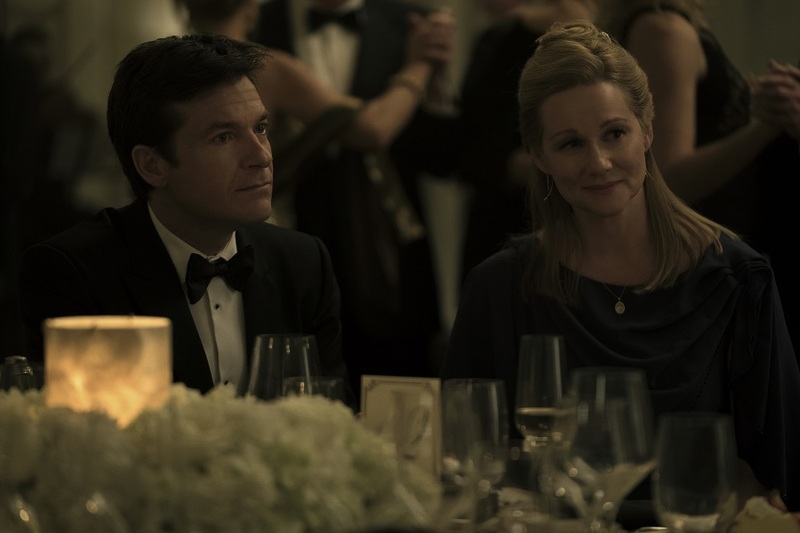 With Jason Bateman and Laura Linney as respectively Marty and Wendy Byrde, a fractured Chicago couple who have to relocate their family to rural Missouri after the former’s money laundering for a Mexican drug cartel goes very wrong, Ozark is a sharp, cunning drama about what you’re comfortable doing, or sometimes not, to maintain your position. “All of life’s a business arrangement,” says one of Marty’s nefarious new partners, Jacob Snell (the great Peter Mullan), and the flipside of that is that every (illegal) business is a form of family. Scrambling to stay alive brought Marty and Wendy’s marriage back from the brink, and one of the things the new season does is explore how their children are now infected by a conspiracy they’re all now party to. New on Netflix: British filmmaker Andrea Arnold (Fish Tank) explores the U.S. and its wayward youth with American Honey (2016, 163 minutes), a road movie about itinerant spruikers that puts a live for the moment philosophy in front and behind the camera; now a canonical crime epic, Martin Scorsese’s Goodfellas (1990, 145 minutes) is an engorged mob guys biopic with Ray Liotta, Robert De Niro and Joe Pesci as self-destructive gangsters. New on Stan: You’re Next (2011, 94 minutes) is a bloody yet bittersweet slasher movie where a soured family reunion becomes a fight for survival when masked intruders start murdering guests; director Adam Wingard keeps the horror close to home; one of the great films about a city and its music culture, 24 Hour Party People (2002, 117 minutes) moves through Manchester from punk onwards as Joy Division and Happy Mondays emerge via creative wit and sardonic selfishness.